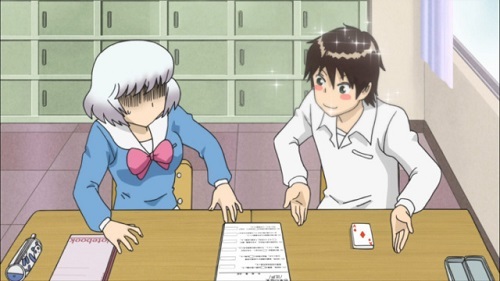 12 Days 2014 (Late) Day 6 – An Entertainingly Distracting Classmate (Tonari no Seki-kun) – Nigorimasen! Tonari no Seki-kun was a pleasure to watch over the course of 21 weekly seven-minute episodes. There’s not much I want to say about it other than I laughed a lot at Yokoi’s reactions to what her classmate Seki was doing at his own desk, I’m looking forward to Vertical Comics’ January release of the manga’s first volume, and I would recommend at least giving the first couple episodes a try if you haven’t seen the show already – it’ll only take about 15 minutes of your time. Tagged 12 Days 2014, Anime, Tonari no Seki-kun.